Is Rocket Spanish The Best Way To Learn Spanish? Rocket Languages Spanish is an innovative language learning program consisting of various components such as interactive audio, progress checker, games, and even a community where you can interact with other Spanish language learners. It aims to cut your learning time of Spanish by up to 50%. So, does it live up to its claims? We find out in this review. The act of learning Spanish is something that many youngsters do in school these days, but most experts agree that learning language in a traditional classroom setting, the way it has always been taught, is simply not all that effective. If you took Spanish in high school or college yet you are unable to carry on a conversation with a fluent Spanish speaker, then a program like Rocket Spanish might be for you. Not only can Rocket Spanish help you to increase your vocabulary, but it will make you more comfortable in using the Spanish you do know in complete sentences. This is one of the leading language learning programs available today, and one that is designed to help you speak and understand your new language faster. Rocket Spanish differs in many ways from traditional methods of teaching Spanish, primarily because it does not focus on the intricacies of conjugating verbs, learning tenses, or genders. Instead, the sole focus of Rocket Spanish is to teach you how to listen and understand a Spanish speaker and be able to carry on a conversation without unnecessary stress. How Can This Program Help You? When it comes to learning a language, it is always important to see who is narrating the program. Language is made up of spoken and written words. While the written word can be obtained anywhere through books, magazines, flashcards, and even online, the spoken component will most likely be missing. If a new user is trying to learn a language, it is important to learn exactly how it is pronounced – and by native speakers. The program is led by a Chilean Spanish speaking man and a fluent Spanish speaking American woman so users learn Spanish the way the natives use it and don’t have to worry about mispronounced Spanish. When you order Rocket Spanish, you will receive either 20 full-length CDs or you can have all of the programs downloadable for your convenience. Many people choose the downloadable version because they cannot put the files on their MP3 player or listen in their car or on their smart phone. Each of these lessons focuses on a number of different aspects of learning Spanish, including basic grammar, commonly used phrases, and Spanish pronunciations. In fact, one of the major focuses of the entire Rocket Spanish program is that it teaches you how to pronounce words and phrases in a way that will make you feel more confident with the language. As you go through these lessons, you will also be able to record your own pronunciations and compare them to fluent speakers. This has been proven to be the most effective way of perfecting pronunciation and to also understand how fluent speakers converse. One of the methods in the Rocket Spanish that is very helpful is the “Hear It, Say It, Write It, Know It” system. This enables you to put all of your knowledge to work immediately. Any Negatives to this Spanish Program You Should Know About? From some of the users feedback, this program works great for those who have never studied another foreign language before and find it a real challenge to grasp the new vocabulary or things like reflexive verbs. Intermediate and advanced users of the program will find Rocket Spanish basic and not paced fast enough. So, if you are already on a path of learning Spanish somewhere else, this isn’t for you. Other users also complained about the fact that it uses quite a bit of English in its explanations. While this may seem to be a issue, it really isn’t since no single language product will appeal to everyone. In fact, it appeals to many of the new Spanish language learners because it uses more English and explains more. This way, new language learners won’t get lost and overwhelmed by lots of Spanish words they struggle to understand. Ultimately, it is about gaining confidence in the language. If you don’t feel confident, what’s the likelihood of continuing language learning? Rocket Spanish overcomes this problem new learners have and sets them on the path to discovering the benefits of their newly acquired language. What Do Real Reviews Say About Rocket Spanish? It is pretty clear from reading user reviews that this program has been very effective for those who want to feel more confident about speaking Spanish. Even though many people know a fair amount of vocabulary, conversing with a fluent speaker is often very stressful. Rocket Spanish simply makes it much easier. Some people are also surprised that Rocket Spanish helped them learn in such a short span of time because the unique method of instruction in this program means that this is a quicker and easier way to learn a new language. Where Can You Buy This Program? In order to make sure that you get a full money back guarantee on this purchase, you should only download rocket Spanish directly from the official website. Also, they are currently offering a 6 day free trial, which does not even require you to submit a credit card. This trial period will enable you to go through the program and see for yourself if this is the best way for you to learn Spanish. One added benefit of this program is that you can download all the files or you can choose to have CDs sent to you in the mail. In either case, you will have full online access to the program, so you can take part in the tests, and record your conversational skills. 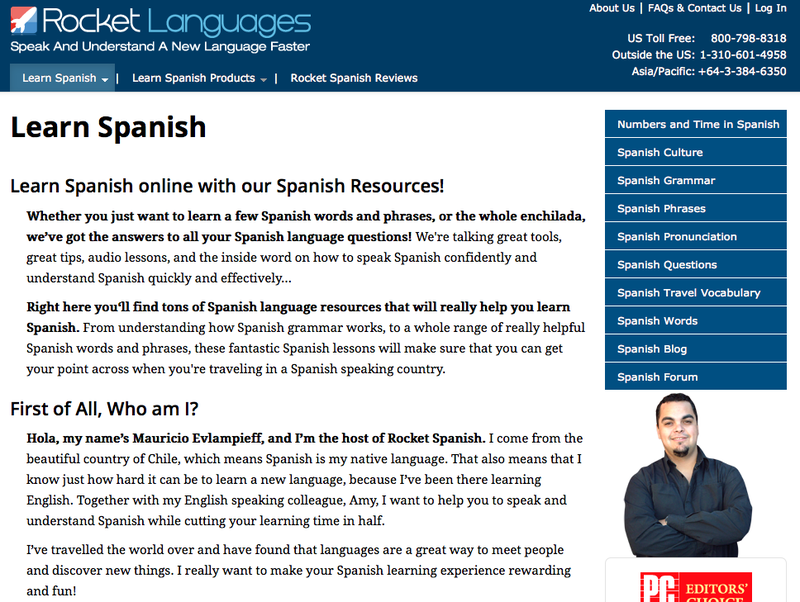 Is Rocket Spanish Right for You? Whether you are interested in learning Spanish so you can speak to Spanish speakers locally, or you are looking for conversational skills and increase vocabulary for travel, Rocket Spanish can help you to feel more confident with speaking Spanish. Not only will you increase your vocabulary… but when Spanish is spoken to you, you will not freeze up. You will be able to speak relaxed and understand what a fluent person is saying.